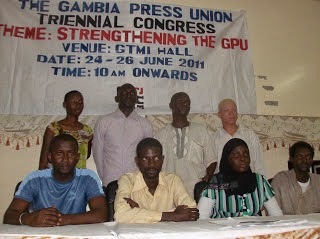 Gambia Press Union’s (GPU) triennial congress of December 20, 2014 has been deferred to [March] next year due to serious irregularities from the outgoing executive. The general membership decided it is improper for the Union to go to congress when a good number of journalists have their membership [application] neither approved nor rejected for over two years, while some bonafide members where unconstitutionally blocked from paying their dues to vote. Journalists also rejected the financial report that was prepared in a slipshod manner and illegally jointly delivered by the outgoing Secretary General Gibairu Janneh and President Emil Touray in the absence of a treasurer, [who resigned two years ago]. There was no proper account in projects like GPU-JAMES project, Newsprint project, Printing Press project, and the Media for Advocacy project. Emil had in a bid to remain in power single-handedly attempted to seek reelection with a mere fraction of the membership with a 30-people voter list. “One third of the general membership shall form a quorum in any properly constituted general meeting of the Union, and all decisions taken in such a meeting shall be binding on the Union,” according to the GPU Constitution. Angered by these irregularities, the GPU’s general membership decided Saturday enough is enough. There will be no congress, and we must from this day set the agenda for a proper congress, the members decided. Having arrived late, session chairperson Gibairu [Janneh] kick started with opening prayers, a statement from Emil, then he presented the Activity Report and later co-present with Emil [Touray] the Financial Report. The general membership by a majority later told him they’ve “totally lost trust and confidence in his leadership” and call on him to step aside and pave the way for a more competent leadership. He highlighted some of the achievement that include the setting up of an accredited GPU School of Journalism and a series of capacity building programmes that were meant to enhance the efficiency of journalists in the country. Abdul Hamid Adiamoh, managing editor of Today newspaper, said there was no legal-base to hold congress for twenty five people to vote - that will be against the Constitution because GPU membership is more two hundred people. He suggested for the outgoing executive of the GPU to resign voluntarily and members put up an interim committee to reschedule the congress. Mustapha Bojang, an accountant at the Daily Observer, agreed. He said the congress has to be deferred to give way for the possible approval of all pending membership applications. He said since February they have paid for some of their staff to become GPU members but there have been no response from the Emil-led executive. Musa S. Sheriff, editor-in-chief of The Voice, said the GPU executive have not laid the ground for a proper congress because when their term expired seven months ago, they failed to hold a congress and did not engage the members on the way forward. “People have resigned, [and there were] no replacements,” he said. Gibairu had earlier announced he is not contesting for executive positions, and according to Nfamara Jawneh, president of the Young Journalists Association (YJAG), Gibairu’s move is a wise decision. “When you are in a boat and you realise that it is sinking, the best thing to do is to jump [off],” he told Gibairu. He stressed that the fact is that “the GPU is sinking” and it is high time for people to come on board and rescue this noble institution. Momodou Edrissa Njie, who earlier declared himself a presidential candidate, said: “We are very disappointed about your decision not to approved journalists to become members of the Union. Sam Sarr, managing editor Foroyaa newspaper, Hatab Fadera, a deputy editor at Daily Observer, Saloumn Sheriff Janko, a senior freelance journalist, Sainey Darboe, editor of The Standard newspaper – all supported calls for the congress to be delayed for the executive to put its house in order. Written by Bakary Ceesay. Additional reporting by Modou S. Joof . A version of this story appeared on The Voice newspaper on Dec. 22.